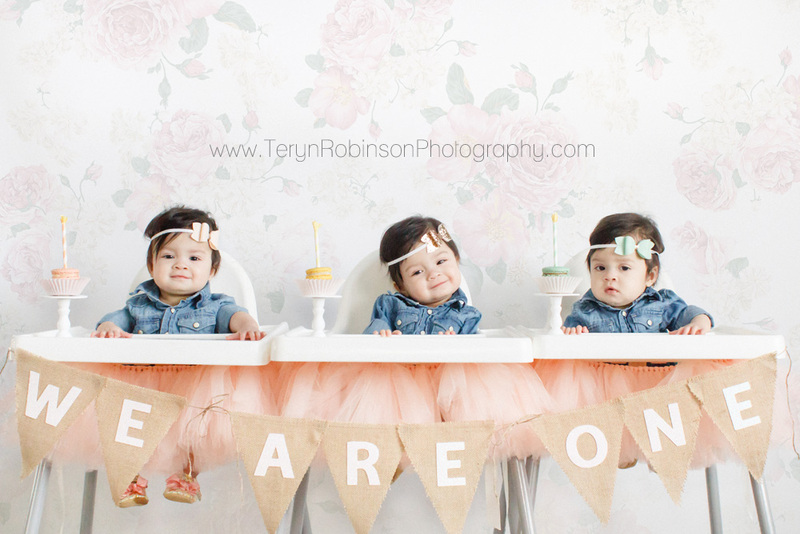 Robinson Triplet Update – We Are Two! I’m only about a month late getting this post up…. better late than never though right?! As usual, things are crazy around our house. We’re still trying to unpack and finish getting settled in our new house and we have 2 year old triplets!!!! WHAT? How are they 2 already? It seemed like they were little babies FOREVER and were never going to get big and then all of a sudden they are big girls wanting to do things for themselves and talking. They say words I didn’t even know we had taught them or they knew. It’s crazy. They are still petite little things at probably just over 20 lbs (they haven’t been weighed in a few months) and they are wearing size 18-24 months mostly. They are running, trying to jump, climbing, and being the cute little girly girls that they are. They steal toys and food from each other but are usually pretty good at giving it back when asked. They love to snuggle with Mommy and Daddy on the couch and give each other hugs and kisses. They also tickle their sisters which is pretty darn adorable. They all love pillows and blankets and have their own “banket” they ask for all day long and take to bed with them. Cats are a favorite right now too which is why we go them the cute cat pillows. Anaia (left) is currently attached to her Koala or as they call it “nleoo nleoo”. She takes it to bed with her and flips out if she loses it or someone takes it from her. She also loves playing “where’s Anaia?” where she runs in the kitchen and hides in the corner and then runs out to where we can see her and laughs hysterically. Grace (middle) snatches toys from her sisters all day long and then runs away smiling. She does usually give it back when I ask her to though. She is the most daring of the 3. She loves being tossed into the air and going for airplane/bee rides. Lily (right) is such a sweet heart and a goofball. She rolls around on the floor squealing and doing karate kicks while she laughs. All 3 girls love to laugh and are really very good girls overall. They are toddlers so they have their moments of irrational tantrums and wanting to be held all day but what kids don’t? They are also really into to who is who and what items are whose. They’ll hold up a blanket or toy and say “Grace’s” or “Lily’s” or “Anaia’s”. They LOVE books but are also are very good and tearing them apart so it’s not uncommon to find random book pages laying around. The next time they pick up the book or random page they get very concerned and say “ohhhh nooooo!”. Something else they say often is “WOAAAHHHH!!!”. I didn’t realize I would say that a lot when they would fall down or do something exciting and I guess they picked up on it haha. We absolutely love these girls more than we ever knew we could and feel so blessed to be their parents. Here is their birthday photo from last year when they turned one. I can’t believe how much they grew in one year!